Citation Information: J Clin Invest. 2005;115(2):237-246. https://doi.org/10.1172/JCI22079. Mechanisms regulating thrombus stabilization remain largely unknown. 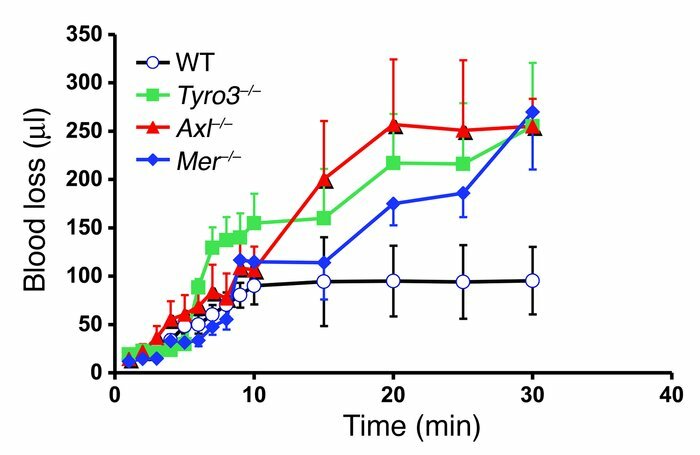 Here, we report that loss of any 1 of the Gas6 receptors (Gas6-Rs), i.e., Tyro3, Axl, or Mer, or delivery of a soluble extracellular domain of Axl that traps Gas6 protects mice against life-threatening thrombosis. Loss of a Gas6-R does not prevent initial platelet aggregation but impairs subsequent stabilization of platelet aggregates, at least in part by reducing “outside-in” signaling and platelet granule secretion. Gas6, through its receptors, activates PI3K and Akt and stimulates tyrosine phosphorylation of the β3 integrin, thereby amplifying outside-in signaling via αIIbβ3. Blocking the Gas6-R–αIIbβ3 integrin cross-talk might be a novel approach to the reduction of thrombosis. Effect of the lack of Tyro3, Axl, or Mer on hemostasis. After 2-mm tail-tip transection, the cut end of the tail was immersed in saline at 37–C. Aliquots of saline solution containing blood were sampled every minute for 10 minutes and then every 5 minutes until 30 minutes. The amount of blood loss was determined by measurement of the hemoglobin content of the aliquots of blood collected in saline (mean ± SEM, n = 10). In WT mice, blood loss reached a plateau within 10 minutes, indicating cessation of bleeding. In contrast, Tyro3–/–, Axl–/–, and Mer–/– mice had a tendency to repetitively rebleed after transient hemostasis.